Along with Pines and Japanese Maples, Junipers are one of the three most frequently used genera for bonsai. Juniperus is a genus of 50+ species of evergreen, coniferous shrubs from dry forests and hillsides throughout the world. Junipers have foliage of two types, needle-like juvenile foliage and scale-like adult foliage, species that exhibit predominantly one or the other are used for bonsai cultivation. The range of colour of the foliage ranges from steely-blue-greens to light greens occasionally with silver or gold hues. Most of the classic Juniper bonsai in Japan have been collected as yamadori from the mountains and can reach ages of 200 years or more. Many display large amounts of natural and artificially created deadwood called jins and sharis which are bleached brilliant white with lime-sulphur. The immature, or needle-like, foliage of a Common Juniper (Juniperus communis). Common Juniper bonsai (Juniperus communis). The mature, or scale-like, foliage of a Juniper sabina bonsai (Juniperus sabina var. sabina). Juniper sabina bonsai (Juniperus sabina var. sabina). The classic Juniper for bonsai is often referred to as the Chinese Juniper. This is a naturally occurring hybrid species called Juniperus x media which is a cross between J.chinensis and J.sabina. (Confusingly Juniperus x media is also referred to in some textbooks as Juniperus pfitzeriana). The foliage can have a mixture of adult and juvenile foliage and as this combination can disrupt the design of a bonsai, so varieties of J.media that display only one form of foliage tend to be used. Juniperus x media 'Blaauw' (named by a Dutch nursery 'Blaauw & co') is a strong growing conifer which carries bluish grey-green scale-like adult foliage. As with other J. x media, if needle-like juvenile foliage appears it can be pinched out until adult foliage appears. Another very popular species for bonsai is Juniperus rigida, the 'Needle Juniper'. As the name suggests J. Rigida has sharply pointed needle foliage as has Juniperus communis a plant found growing wild in many parts of Europe, though it should be noted that collected J.communis is notoriously difficult to keep alive for more than 2 or 3 years after collection. Juniperus squamata (needle foliage), J.sargentii (scale foliage), J.chinensis, J.Sabina, J.horizontalis procumbens, J.communis hornbrookii are also popularly used as are dozens of other species and varieties. 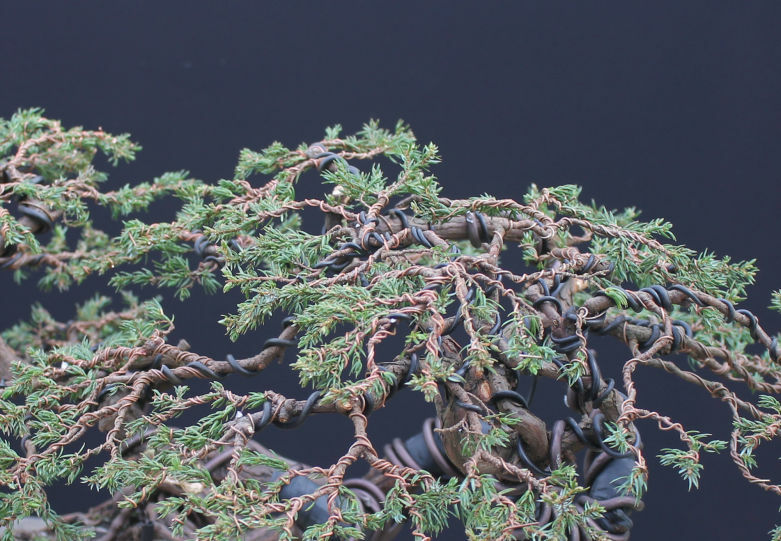 The Shimpaku is a Chinese Juniper variety with bright green new foliage that fades to a darker green when mature. 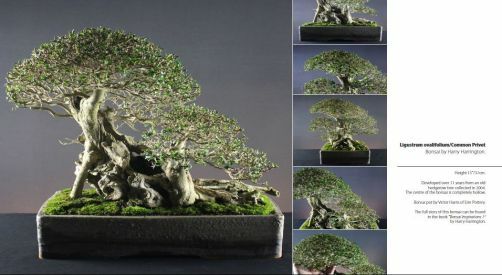 The tree has naturally dense and compact foliage which is excellent for bonsai. As with a number of Juniper varieties, the foliage can turn a brown or bronze colour after frost and will remain so until Spring when it turns back to a more familiar (and healthy-looking) green. The Blaaws Juniper is more vigorous than the Shimpaku but has less naturally well-ramified growth. In comparison, the green foliage has a blue-grey tint. Common to Europe and similar in colour to the Shimpaku, the Sabina has looser but finer foliage that requires continual pruning of vigourous shoots to encourage ramification. A Juniper with blue-green foliage and beautiful red bark, more commonly found in the United States. The San Jose is reluctant to form uniformly adult/scale foliage and on occasions enthusiasts will opt to develop with juvenile/needle foliage only. A very common Juniper variety sold in garden centres and shopping malls across the world, J. horizontalis has very weak trunks and branches leading to a naturally horizontal, creeping growth habit. Predominantly mature/scale foliage in a range of colours from dark green to steel blue (depending on the specific variety). Trunks are very slow to thicken. Very commonly found growing in European gardens and nurseries, J. squamata carries juvenile/needle foliage only in a wide variety of colours, depending on the variety. 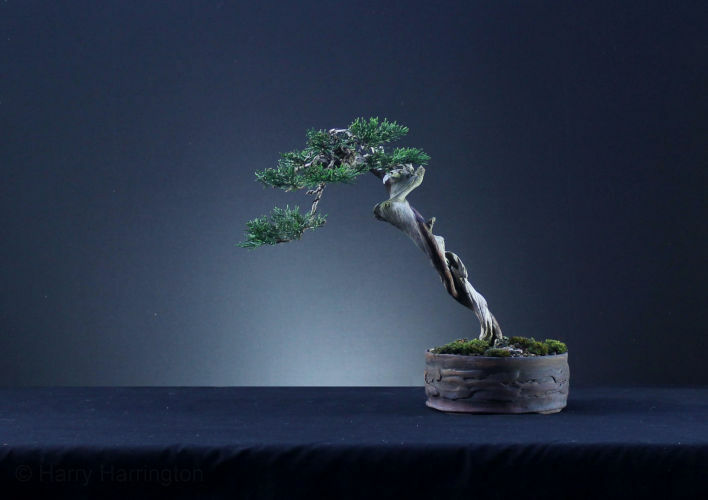 Very vigorous, fast growing and responsive to bonsai techniques but its appearance suffers from the retention of old needles that steadfastly remain on the tree after dying and browning off. J. communis is the only truly native Juniper in the UK. A needle juniper with dull-green foliage, the Common Juniper has a terrible reputation for dying inexplicably 2-3 years after collection however garden centre/nursery specimens appear to be far more robust. Position Full sun though Junipers with predominately scale-like foliage benefit from a little shade from the midday sun. During winter protect during frosts below -10°C but coniferous trees should not be over wintered in dark outbuildings unless temperatures are consistently below -10°C, at this point there is no requirement for light. Never try to grow Junipers indoors, though they may seem to tolerate indoor cultivation at first, poor humidity, lack of light and dormancy will eventually kill them. Do not trust a vendor, seller, book or website that claims Junipers can be grown successfully indoors. Dead Junipers can continue to display normal foliage colour for weeks or even months after they have died at the roots. Watering Ensure Junipers growing in poor, compacted organic soils are not over watered as they suffer root rot easily, foliage should be misted frequently to help keep pores free of dust enabling them to breathe. In the case of trees that have been recently repotted or have root problems, misting is essential as conifers are able to absorb enough water through their leaf surface to maintain health until the roots are able to support the tree themselves. Misting also avoids excess transpiration and water loss on hot summer days. Feeding Feed fortnightly; high nitrogen fertiliser from start of growth in Spring until mid-summer and a balanced feed until late summer until winter. Occasional replacement feeds with an acidic fertiliser such as Miracid are highly recommended, particularly in hard (lime) water areas. Repot in April-May, do not repot or root-prune too early in the year. It is always better to wait until the tree has started into growth before repotting. Can also be very successfully repotted during the warmth and humidity of August, however avoid repotting during very hot days. Once established in a good quality soil, repot infrequently every 3-5 years. Never bare-root a Juniper or change more than a third of the soil (or at very most half) in any one repotting. An inorganic-clay based soil is essential for Junipers as they are prone to very poor-health in old, compacted, organic soils. Because Junipers cannot be bare-rooted or have more than one third of the soil mass changed in one year, it is essential that a soil with good particle structure is used. Avoid Akadama and similar low-fired clays that break down after one to two years. The wood of Juniperus is extremely flexible and branches of several centimetres in diameter remain supple enough to be shaped with ease. Junipers can be wired at any time of the year including the semi-dormant period of Winter. Do not create heavy bends in trunks and branches during temperatures of 0ºC or less. 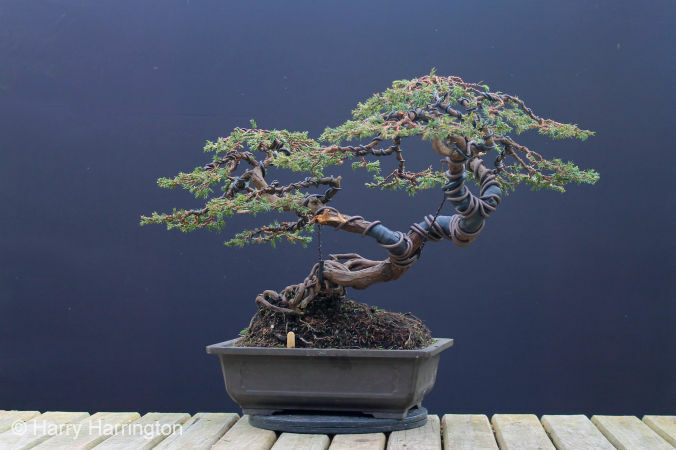 For a well-defined Juniper bonsai, the entire tree will require 100% wiring at least once in its lifetime. The setting time for newly-wired branches depends on the thickness and the vigour of individual shoots; expect anything from 3 months to a year. The greater the amount of growth that emerges from a shoot, the quicker it will thicken and set into its new position. The thicker a branch is, the longer it will take to set. Watch for wire suddenly cutting into the bark during the Summer as the wood will thicken dramatically during this period, however, shallow wire-marks are not a great problem and will disappear within a few months to a year (again depending on the strength and vigour of the individual branch).